Center for the Performing Arts at Penn State University first started presenting work in 1957. From dance performances to master classes and musicals, the Center for the Performing Arts is sparking “discovery of passion, inspiration, and inner truths” through its wide range of performance presentations. The 13-14 performance season brought such greats as Disney’s Beauty and the Beast and the Moscow Festival Ballet’s Swan Lake. The Center for the Performing Arts, under the current direction of George Trudeau, is strengthening the community through performances, workshops, and events for all ages and interests. International: The Center for the Performing Arts at Penn State (CPA) brings voices from around the globe to central Pennsylvania. In our 13-14 season, those voices ranged from Inner Mongolia, to Afghanistan, Japan, Brazil, Russia, Australia, and Benin. 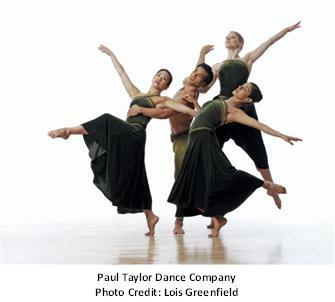 We present major companies representing the diverse voices that make up the American dance landscape, including Martha Graham, Merce Cunningham, and most recently, the Paul Taylor Company. The CPA’s mission is to spark passion, inspiration, and creativity by providing opportunities to engage with great artists from around the world. Immersive: The CPA is deeply and passionately committed to engagement with the artists and art forms we represent and providing multiple points of entry for the community to connect with our work. One way we do this is through our free family workshops. By leveraging the resources we have on campus, we engage our student-artists with the community. This provides an immersive experience for children and their families to participate in art making that is related to CPA performances. A movement workshop in the Penn State Arboretum in connection with MOMIX’s Botanica performance; a mask-making and ballet workshop in connection with a recent presentation of Swan Lake are just two examples of ways the community can learn more about the performance coming up, while giving the University's student-artists a chance to stretch their skills and make a difference in our community. Integrated: The artists that the CPA presents are interested in integrating themselves into Penn State’s curriculum. This integration can take the form of a simple master class, or in a more extended and deeper way, such as Diavolo’s integration into the work of dance, architecture, landscape architecture, and engineering classes while they participated in an 18-month-long project through the Creative Campus Innovations Fund. What makes Penn State University and its event series unique as a university presenter? The CPA engages Penn State students in a number of ways, and as a result, we have an unusually high number of students who attend our performances. We are a multi-disciplinary presenter, and over the course of the season, 34% of our total audience is comprised of Penn State students. As for dance performances, that number rises to 55% - a full two-thirds of the audience for Compagnie Kafig were Penn State students. We have a fantastic relationship with a mostly online course, Introduction to the Performing Arts, which uses CPA events as its “text.” This course instructs students to attend five performances over the course of the semester and complete online work relating to each performance. This is a contributing - but not defining factor - to explain these high rates of participation. The CPA also receives our largest annual gift from our student activity fee fund, a grant that directly subsidizes the cost of student tickets, thus keeping our ticket prices extremely affordable for Penn State students. What has been some of the most popular presentations at the Center for the Performing Arts and what made them so successful? This year, two dance-centric performances were sellouts for The CPA. West Side Story with the unmistakable stamp of Jerome Robbins and the Moscow Festival Ballet’s Swan Lake, featuring one of the strongest male dancers as the “jester” in recent memory, both resonated with our community in a big way. The audience development department created a family dance workshop in connection with Swan Lake, where young children made swan masks, decorated a black cape (for “wings”), heard the story of Swan Lake, and were led by University Dance Company student dancers in a basic ballet workshop. Also, The CPA is known for our presentations of contemporary circus companies, and we crowd sourced part of the commissioning fee for Cirque Eloize’s new work, Cirkopolis. The house was nearly full, and we are gratified that the community responds to this fun mix of dance, acrobatics, music, and theatre.